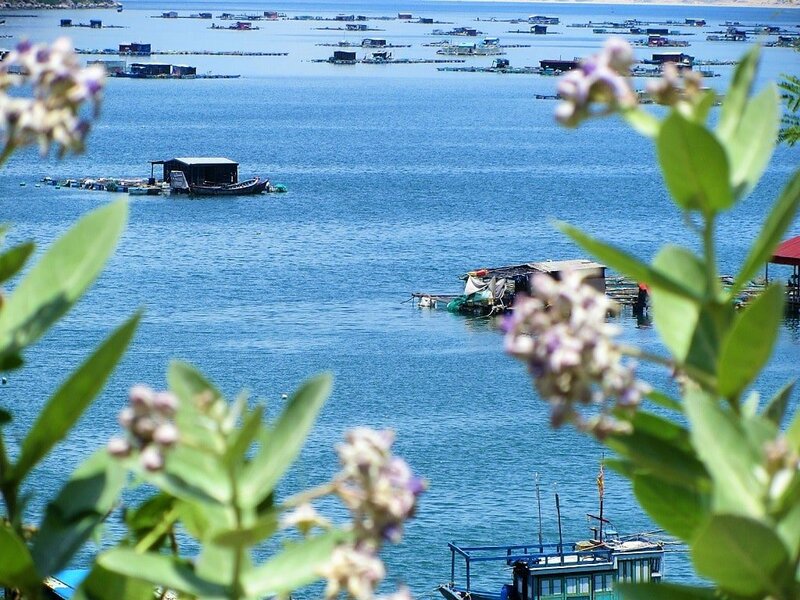 With calm, clear waters, rocky escarpments, hidden coves, beaches squeezed between forested hills, remote fishing villages, and excellent transport infrastructure, Vung Ro Bay has really got it going on. But, despite a mammoth investment plan and construction proposal by a giant American corporation a few years back, there has so far been no development whatsoever on this achingly beautiful promontory on Vietnam’s south-central coast. This means that, for now at least, Vung Ro Bay is easily accessible, stunningly beautiful, and largely empty of foreign tourists. Change is bound to come sooner or later, so visit now if you want to see Vung Ro Bay before construction and development spoil its current condition. Ideal for independent travellers on two wheels, Vung Ro Bay is great as a day-night trip from Nha Trang or as a stop on a longer coastal route. In the following guide, I’ve written a description of Vung Ro Bay, including things to see, places to stay and eat, and how to get there, as well as an annotated map of the area. Anytime of year is fine to visit Vung Ro Bay, but the best weather conditions I’ve experienced have been between March and September. Vung Ro Bay makes a good trip from Nha Trang for independent travellers looking to get off the beaten track for a couple of days. The bay can be combined with other excellent beaches in the area to create a longer coastal itinerary (see Related Posts). Vung Ro Bay is also an essential stop on most of my Saigon-to-Hanoi motorbike routes. 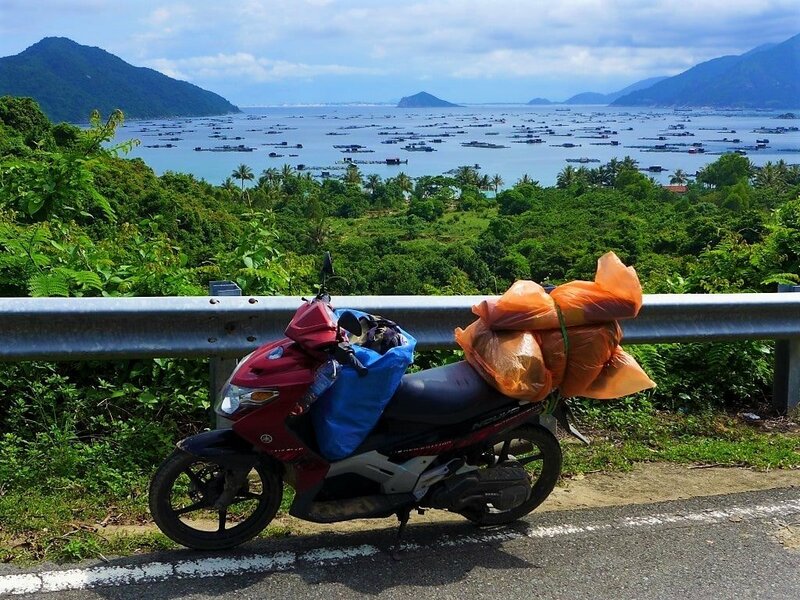 Ever since I first glimpsed this gorgeous natural harbour – from the seat of my bicycle, high above the bay on the precarious, meandering switchbacks of the Cả Pass – I’ve always thought of it as one of the loveliest stretches of coast in Vietnam. 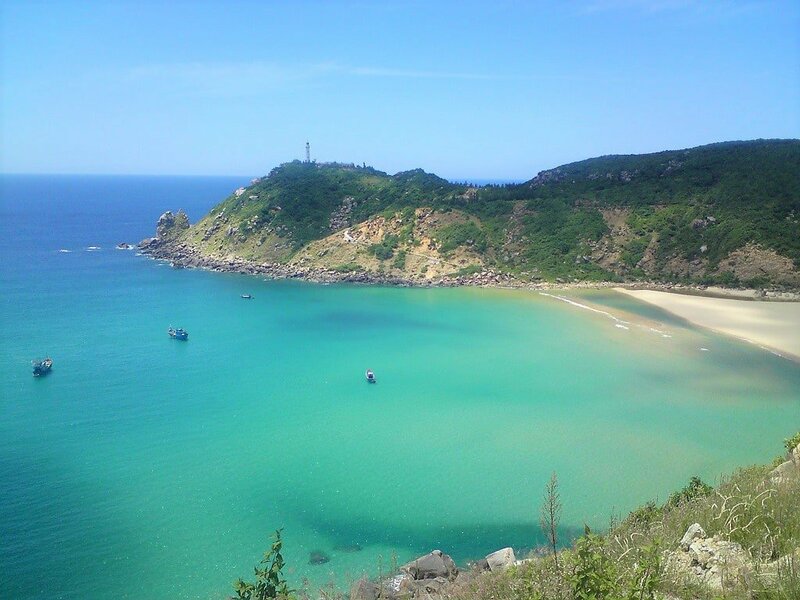 Over the years, I’ve visited many times; exploring the floating fishing villages, climbing the steps to the historic lighthouse, driving the deserted coast roads, and swimming at Bai Mon, one of my favourite beaches in the country. Despite its natural beauty and ease of access, foreign travellers rarely make it here (although it’s popular with domestic road-trippers), and there’s practically no tourist development at all. However, when I first wrote this guide to Vung Ro Bay, in 2014, plans were afoot for an enormous, multi-billion-dollar project, that would transform the area. I said, back then, that if you wanted to see Vung Ro Bay, 2015 was probably your last chance to do so. Thankfully, none of that has come to pass. But, the local people I spoke to on my most recent visit (July 2017), all said that the land had been sold and it was just a matter of time before construction began. Vung Ro Bay is formed by a tongue of rugged land that spreads southwest, sheltering the main shoreline from the winds and weather coming off the East Sea. 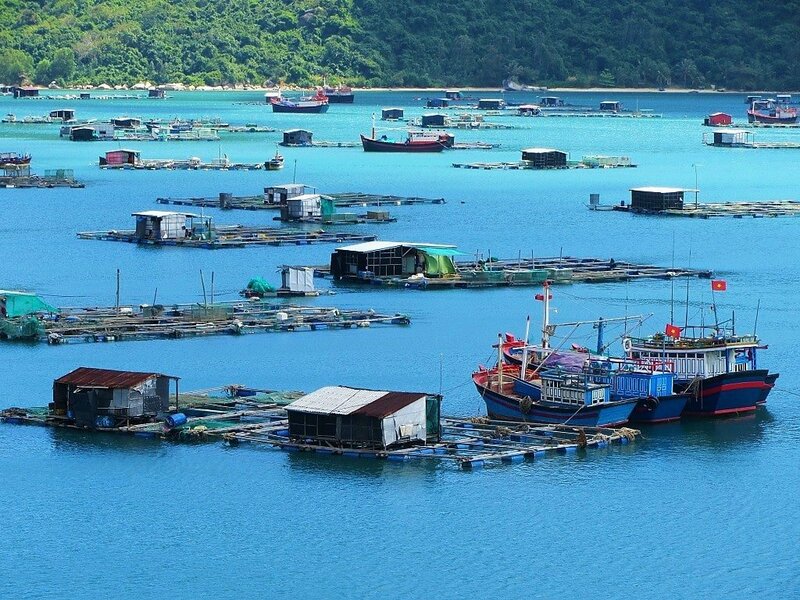 The large main bay is dotted with hundreds of floating homes, fish farms and wooden fishing boats. A dramatic backdrop is created by craggy, forested mountains that culminate in an 80-metre-high, free-standing slab of stone atop the highest peak, known as Núi Đá Bia – ‘Tombstone Mountain’. 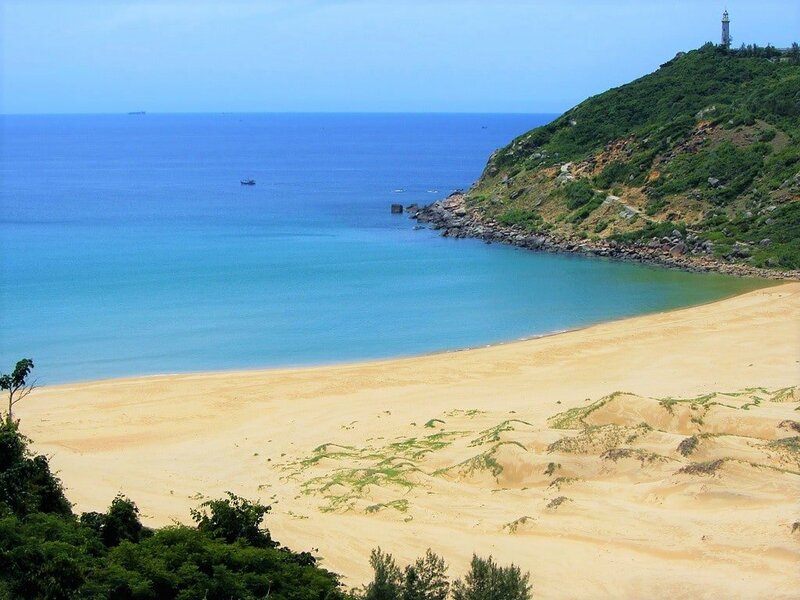 North of the main bay, there’s a perfect V-shaped inlet, filled with golden sand, called Bai Mon. This fabulous beach is great for swimming, and it’s the only place that offers any form of accommodation in Vung Ro. From the beach, there’s a long, steep staircase up to a lighthouse. Originally constructed under French colonial rule, in 1890, the lighthouse was destroyed in 1965 during the war, and rebuilt in 1995. Visitors to Mon Beach can climb the rocky hillside via a steep stairway, winding all the way up to the lighthouse, inside which there’s a rickety spiral stairwell leading to the light itself. From here, the panoramic views of the bay are superb. The lighthouse was one of the first ever to be built in Vietnam, and locals came to refer to the area as Mũi Điện – ‘Electric Cape’. (Entrance to Mon Beach and the lighthouse is 20,000vnd). Until recently, Vung Ro Bay was best-known for a military incident that occurred during the Vietnam War, rather than for its natural beauty. In February 1965, a North Vietnamese vessel was found to be smuggling war supplies into Vung Ro Bay in order to aid the North’s campaign to ‘liberate’ the American-backed South Vietnam. On discovering this, the latter sent in ships, planes and a submarine to sink the North Vietnamese boat and capture the smuggled goods, which included thousands of arms and a million rounds of ammunition. The North Vietnamese lost that battle but they eventually won the war, and today there’s a large monument and memorial near the water’s edge, erected to commemorate the Vietnamese soldiers who fought and died defending the supply ship and the bay. Although there’s no real accommodation options in Vung Ro Bay at this time, it is possible to camp on Mon Beach, and this is a great way to experience the area. Alternatively, Dai Lanh Beach, just 30 minutes south of Vung Ro has a few good mini-hotels, and Tuy Hoa, 45 minutes to the north, has a host of decent accommodation options. Camping on Mon Beach: Just to the right, after going through the entrance gate to Mon Beach and passing the bridge, a small concrete path leads down to a small, corrugated-iron-roofed structure, called Chú Mười. Run by a pleasant Vietnamese couple, two-man tents are available to rent for 100,000vnd ($4) a night. Or, if you have your own tent, you can pitch it for free (you just have to pay the 20,000vnd entrance fee). Depending on the weather conditions, you’re free to make camp anywhere on the grounds, including right on the glorious, wide, golden sands of Mon Beach, next to the sapphire-coloured surf. If you don’t want to spend the night under canvas, Mr Mười (the husband) will let you sleep on one of their beds, or on the floor, for 40,000vnd ($2). This is all excellent value for budget travellers, and there can be few campsites better located than this. 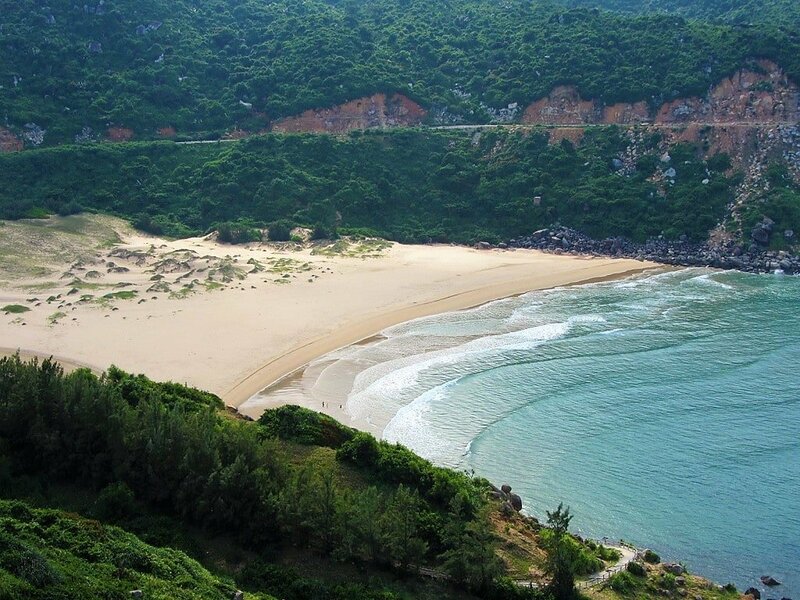 Dai Lanh Beach: A beautiful arc of sand at the bottom of the Cả Pass, just south of Vung Ro Bay, Dai Lanh Beach is a good place to base yourself for the night, while spending the day exploring the bay. Several small hotels and local guesthouses (nhà nghỉ) line the main road as it passes through town and along the beach. 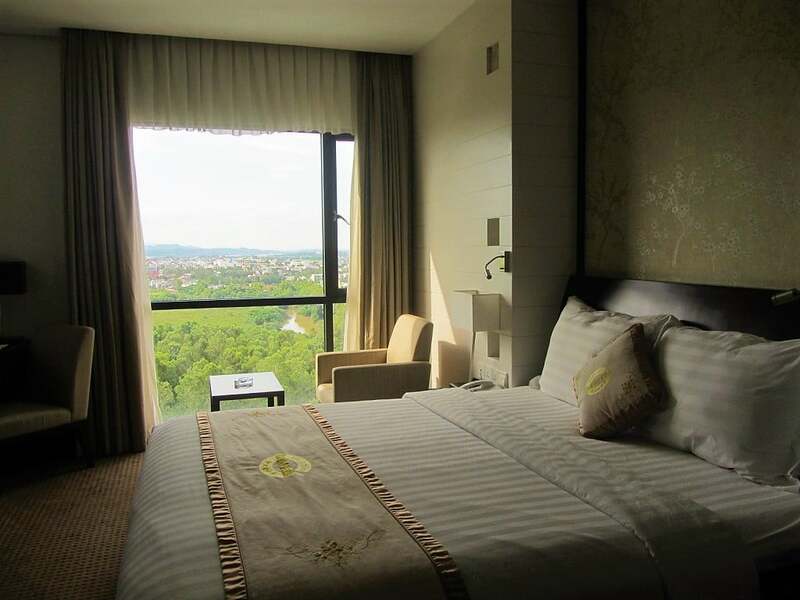 The best is Binh Lieu Hotel (058 3949 138; 200,000-300,000vnd a night). 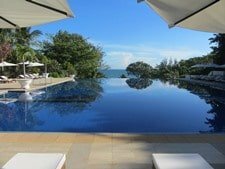 For more about accommodation on Dai Lanh Beach, take a look at my full guide here. Tuy Hoa City: A sizable and rarely visited city, Tuy Hoa is not far north of Vung Ro Bay, and a good place to stay for a night or two while exploring the area. There are many accommodation options here. Cheap, clean, and large rooms are aplenty at the many mini-hotels that line Hung Vuong Street: try Thanh Long Hotel (from $10) among many others. Excellent mid-range value can be found at the Cendeluxe Hotel (from $50), which has a swimming pool and spectacular views of the surrounding area from it rooms and sky bar. VietStar Resort & Spa, a few kilometres north of the city, is also a marvelously landscaped, atmospheric, and tranquil place to stay (from $60). 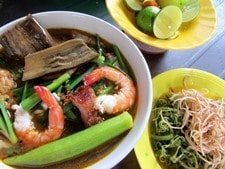 There are very few dining options in and around Vung Ro Bay. At Mon Beach, there’s a small shack on the right after the ticket kiosk, called Chú Mười. Run by an hospitable older couple, they can rustle up good, home-cooked meals, including some fresh seafood, free-range chicken, and, of course, rice and local vegetables in season. This is a good option (in fact, it’s the only option) if you’re camping on the beach here. A popular choice for domestic visitors is to dine at one of the floating seafood restaurants (bè nổi) in Vung Ro Bay itself. It’s difficult to imagine a more scenic setting for a meal. The fish and crustaceans are as fresh as can be: fished directly from the floating farms scattered across the lagoon. Prices are pretty reasonable considering this is some of the freshest seafood you’ll ever have. Choose from lobster, red snapper, giant shrimp, oysters and all number of other seafood. Simply cooked and accompanied by lots of local beer, this is a meal to remember; perfect if you’re travelling in a group. The floating restaurants are a short boat ride from the shore. Look out for signs by the roadside. Vung Ro Bay is located 100km north of Nha Trang and 40km south of Tuy Hoa. It’s easily reached by motorbike, bicycle or taxi via well-made and scenic coastal roads. However, public transportation, although regularly passing nearby on Highway 1, does not reach Vung Ro Bay itself. Flight and rail connections to Tuy Hoa City are good and regular. By Motorbike, Bicycle, Taxi: Approaching Vung Ro Bay from the south, take the Cả Pass on Highway 1 (QL1A). This is one of the most scenic sections of coast road in Vietnam, affording superb views down over Vung Ro Bay. At the top of the pass there’s a right turn (due east) signposted to Vung Ro Bay and Mon Beach. This smaller paved road (Đường 29) leads down to Vung Ro Port, from where it turns sharply east again, heading along the shoreline of Vung Ro Bay. The road then climbs over a forested hill to Mon Beach. 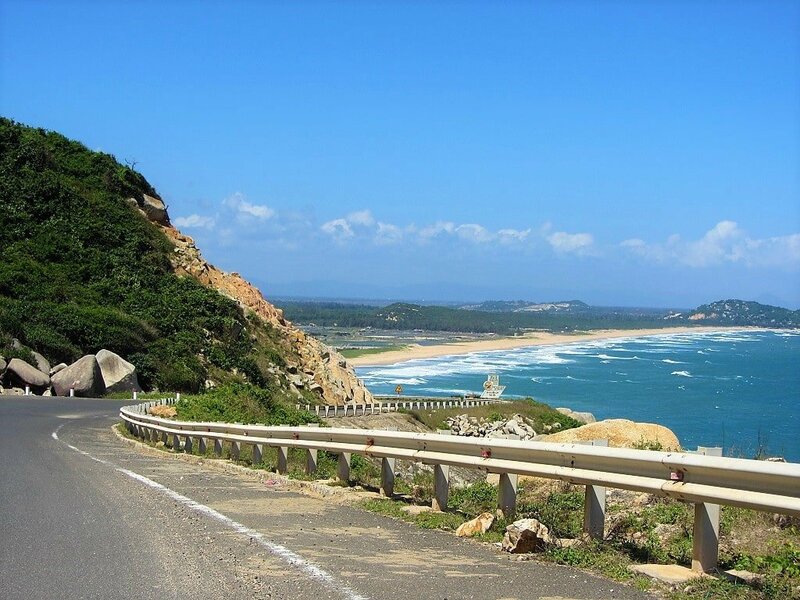 From here, continue north along the ocean road past a fabulous stretch of coastal scenery. Then keep northwards on Route 29 (QL29) and Phuoc Tan-Bai Nga Street all the way past Tuy Hoa Airport and over the long bridge into Tuy Hoa City. If you have your own wheels, it’s a beautiful ride and can be incorporated with other scenic routes in the area to create a longer coastal road trip (see Related Posts). 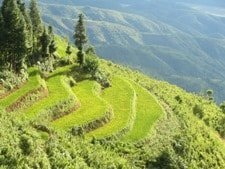 If you don’t have your own transportation, you should be able to arrange a taxi to take you on this route from most accommodations in either Dai Lanh to the south or Tuy Hoa to the north. By Bus: All the north-south buses, that ply Highway 1 between Tuy Hoa and Nha Trang, bypass Vung Ro Bay by taking either the Cả Pass or the new tunnel under the pass (due to open in September 2017). This means that, if you want to reach Vung Ro Bay by public bus, you will need to ask the driver to drop you somewhere near the Cả Pass and then try to find a xe ôm (motorbike taxi) to take you the rest of the way to Mon Beach. However, this is quite unlikely, so you would be better off trying to arrange a xe ôm or regular taxi from either Tuy Hoa or Dai Lanh Beach. By Air: Tuy Hoa Airport is only 25km north of Vung Ro Bay, linked via a beautiful coast road (QL29). Tuy Hoa is served by Vietnam Airlines, Jetstar, and Vietjet: between the three of them, there are pretty much daily flights between Tuy Hoa, Saigon and Hanoi. This airport is sure to see increased flight connections as tourist development spreads along this stretch of coastline. By Train: Tuy Hoa is a major stop for all Reunification trains travelling on the main north-south line. You can buy train tickets to Tuy Hoa from all other major city stations along Vietnam’s coastal rail line. This entry was posted in ALL, Beaches, DESTINATIONS, Off Beaten Path, The Centre and tagged Bãi Môn, beach, guide, Mũi Điện, phu yen, travel, Tuy Hoa, Vietnam, Vung Ro. Bookmark the permalink. It must be something to do with the winds at that time of year, because whenever I’ve visited Vung Ro Bay and Bai Mon Beach, the sea has been perfect for swimming: calm, clear, and with no undercurrent. I would suggest another visit between April and October – hopefully then the conditions will be suitable for swimming. I also was statione there in 1968 with Miuws 11 and operated a 26 foot LCPL. Went through TET Ok but 7 reliefs killed a month after I shipped out. 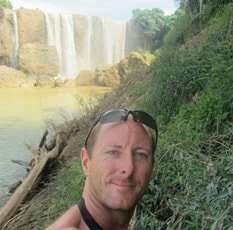 Very nice post and travel blog that I have followed you for a while. 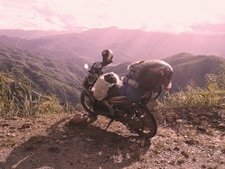 As Vietnamese solo biker for years I still find it best way to explore my country on 2 wheels and the travel stories to be told on road trips seems never ending. Every time I hop on my bike touring the same places that I’ve been to, I am still wowed by something. I am currently in Whale island and deading to Vung Ro bay tomorrow. I can’t wait to meet Mr. Muoi and get to know his local life by the beach. Thanks for sharing your enthusiasm about Vietnam. Cheers ! Thanks. It’s great to hear you enjoy riding around Vietnam on your bike and that you’ve been enjoying my site. I hope you get a chance to meet Mr Muoi. I think I commented on this before, but the oil refinery/port was a land grab by the government to get the fishing families out of the bay. I’d guess a tourism project will be scheduled soon, though. hi Tom ~ Hai and I (Eating Saigon!) 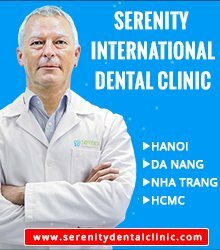 are back in Saigon for a bit and thinking of spending a few days in Nha Trang area next week. Do you know whether the “massive construction” around Tung Ro Bay has begun??? We might want to run up there from Nha Trang for a day or 2, but would hate to encounter giant bulldozers! I was in Vung Ro Bay about 3 months ago and there was no sign of construction starting any time soon, so I hope it’s still like that now. However, a couple of readers have written over the last two months to say that construction has started to transform the nearby Dai Lanh Beach, after the opening of the tunnels. If you’re on two wheels, check out Hon Gom Sandbar too if you get the time. I hope you have a great time, and please do let me know any updates if you go. I like the place and have probably been there 4-5 times a year during the last 5 years, where I enjoy a coffee a walk around taking photos of the local activities. Main production is fishing and on land making lobster/crab cages. Only negative thins imho is the far too many cages out the the bay, which spoils part of the view, however, I also understand that making a living for the local people is more important than the view for us tourists. Glad you enjoy visiting the bay. That’s interesting. Very different times, of course. Vung Ro is a beautiful spot these days, and probably on the cusp of big development. I hope some one from your unit gets in touch with you. Tony, I arrived at Vung Ro with the Army, 124 Transportation Battalion in May 1968, to run truck convoys to Tuy Hoa and Cam Rahn. You obviously were not there the tragic night of 6 June, 1968 when we got overrun by VC and lost 5 men KIA and several Navy men. This is an amazing place. Rode from Quy Nhon to Nha Trang and stopped here to relax during the afternoon heat. This is the most beautiful and interesting section of coastline I’ve seen in Vietnam so far. No sign of construction (or tourists) and the “deep natural harbor” is still home to a vibrant and very active fishing community. First of all thank you for the informative article and blog. According to one reader who visited last month, there’s no sign of construction having started yet – it’s still a beautiful place to visit. I was in Vung Ro with the navy Miuws 11 in late 60’s. Stayed there with a Army unit. mostly truck drivers. There was a place for oil tanker ships to unload. Yes, there is still a pier for oil tankers to dock in Vung Ro Bay today. Back in 1968 I was stationed with Jim Ellis (Navy) and others at Vung Ro. Spent six months there and eventually was stationed at Qui Nhon. Looking into getting a passport and return to Vung Ro. Understand that there has been some development in Vung Ro. Is it still feasible for a return trip sometime in 2016 or has the build up limited out ability to enjoy the beaches after the passage of 47 years. Enjoy this site. Many thanks for the updates. Butch C.
So far the development has been nothing but talk and planning. 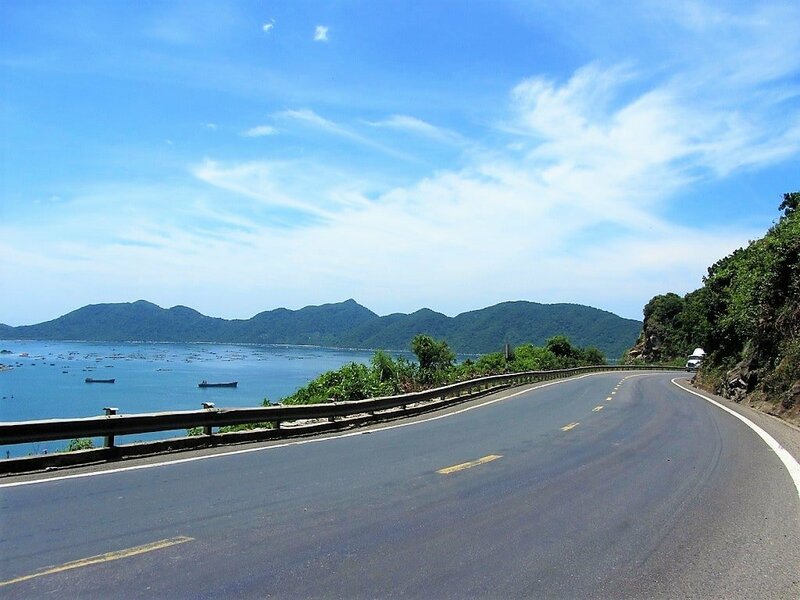 The one major development has been the improvement of roads to Vung Ro Bay – this, of course, makes it much easier to access, either from Quy Nhon/Tuy Hoa from the north or Nha Trang from the south. Unless major works start in the next few months then I don’t see any problem for you visiting this area and enjoying the beaches and bays in 2016. I certainly hope the development projects stall as long as possible so that everyone can enjoy this bay. Thank you for the great site, it has helped me a lot. Is the Vung Ro Bay still accessible or has the building started yet? I am going to Vietnam little over a month and it would be nice to visit Vung Ro Bay. I planned a trip there but because of heavy rains I had to abandon it and stayed in Dai Lanh for two nights. Then I took a train (the only one) to Tuy Hua and took aglipse of the VungRo Bay from the train window. It is a real beauty! I also noticed one thing – a row of tanker cars on the road and a small, but not exactly newly looking rafinery down there…. That’s a shame about the weather. That oil refinery has been there for years, but there’s a new refinery planned. No sign of it at my last visit in October 2014 though. While it would be great to think that an unspoiled place like this could remain as it is, it’s obviously unrealistic. Hopefully they’ll delay beginning construction long enough for me to pay a visit. Yes, I suppose it’s inevitable that places like Vung Ro will eventually be developed – we’re lucky to see some of them before that happens! I hope you find the time to visit soon. My unit was stationed here.Inshore undersea Undersea Warfare Group (IUWG 1 Unit 5. We were overrun during TET 68. Lost 25. We left a marble memorial but understand it has been since destroyed. Thanks, Jim. That’s very interesting. I haven’t seen or heard of the marble memorial. I’ll have a look next time I go there. Thanks Tom. It was on top of the first point after you enter the harbor. First point past the main pier going towards the ocean or inner hsrbor.